Super Eagles have begun the final phase of the Russia 2018 World Cup qualifiers with a 2-1 win over Zambia in an entertaining group B match decided at the Levy Mwanawasa stadium in Ndola, Zambia. Youngsters Alex Iwobi and Kelechi Iheanacho scored in the first half to give the Eagles a two-goal lead, but Collins Mbesuma pulled one back for Chipolopolo in the second. The Zambians started the game strongly, with good short passes and dominant physicality, but the Eagles were first to cause a scare when Alex Iwobi’s clever through ball put Brown Ideye through, but he was wrongly flagged offside. The Zambians also threatened and soon called Nigeria’s goalkeeper, Carl Ikeme to duty with Rainford Kalaba’s powerful header from seven yards. 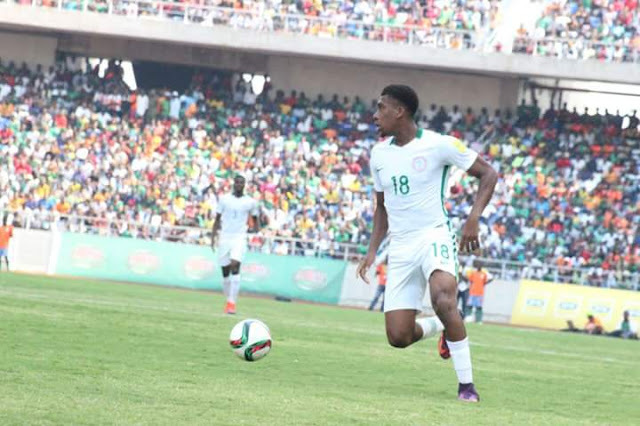 Nigeria, however, took the lead just after the half hour when the impressive Iwobi capitalized on a poor clearance to fire past Kennedy Nwinee. Thereafter, Nigeria grew in confidence and style, with beautiful interplay from the attacking trio of Iheanacho, Iwobi and Ideye. It was from one of such that Ideye freed Iheanacho, who rounded Nwinee before finishing with great composure. The introduction of Kondwani Mtonga and Jackson Mwanza early in the second half tilted play to the hosts, as they piled pressure on the Nigerian backline. Carl Ikeme was continuously in action, once again denying Kalaba from close range after the latter skipped past Wilfred Ndidi to fire a shot at goal. Ikeme, however could not stop Mbesuma who stood strong to pull one back for the hosts after Kenneth Omeruo fluffed with a low cross. The Zambians pushed for an equalizer but Anderson Esiti’s introduction returned stability to the Eagles’ struggling midfield, helping them hold on for a famous win. The Super Eagles have thus picked the first three points in group B, with their next match coming up next month against Algeria in Uyo.